In the fight against cancer, scientists and clinicians have looked toward novel approaches that provide a more comprehensive understanding of the molecular mechanisms that drive the disease—all with the hope of uncovering new therapies that afford many patients a better quality of care. To that end, in August of 2015, the National Cancer Institute (NCI) began enrolling patients into a unique initiative that looked to analyze cancer patients’ tumors for actionable mutations for which a targeted therapy already exists. The unique aspect is that patients were grouped based on their mutations and not their specific cancer—with the hope that treating these cancers on the basis of their mutational profile will be more effective. 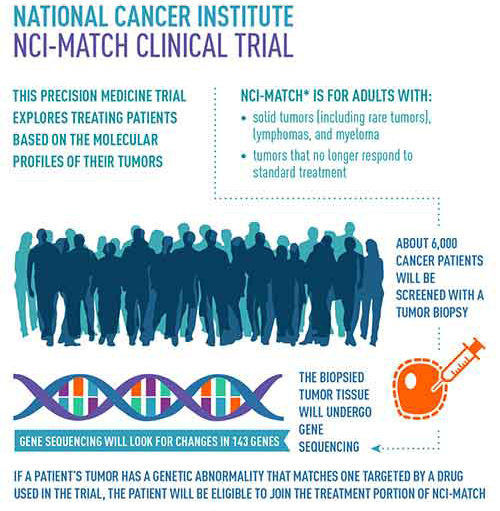 The program set up by NCI is called the Molecular Analysis for Therapy Choice (NCI-MATCH) and is looking to examine tumor samples from approximately 6,000 patients. The goals are ambitious, and complicated by the concerns expressed by many researchers about the complexity, accuracy, and reproducibility of next-generation sequencing (NGS) for application in clinical trials. However, investigators involved with NCI-MATCH set out to address whether the methodologies were valid that the clinical centers were using to isolate, sequence, and analyze the array of tumor samples being collected. Now, a recent report in The Journal of Molecular Diagnostics—entitled “Analytical Validation of the Next-Generation Sequencing Assay for a Nationwide Signal-Finding Clinical Trial”—confirms that the assay tailored for this trial is highly sensitive for detecting genetic mutations from a variety of tumor tissue and, for the first time, has been reproduced with accuracy by multiple clinical laboratories, laying the groundwork for future clinical utility. The results clearly show that locked and controlled procedures permit the reliable, accurate, and reproducible use of NGS for clinical purposes. The NCI-MATCH investigators, using the Oncomine Cancer Panel assay and the Personal Genome Machine, were able to detect more than 4,000 predefined genomic variations across 143 genes, including single nucleotide variants (SNVs), insertions/deletions (indels), copy number variations (CNVs), and gene fusions. 186 samples and 12 cell lines were tested at four different laboratories. Steps were taken to maximize standardization, including the development of standard operating procedures, use of the same commercial assay and instruments, and face-to-face discussions. The investigators found that the assay results were highly reproducible, with the same results across multiple laboratories. This is critical for future clinical use leading to improved patient outcomes.